The completely redesigned RS2205-S is updated with what racing functional multirotors absolutely needs. The engine is lighter, produces a faster bell rotation response, greater thrust, uses premium quality materials and backed up with legendary EMAX production quality. 2 grams lighter than the first version of the RS2205, the RS2205-S is a 2205 engine that has been revised for the weight conscious runner. The hood has been redesigned to have a lower profile without sacrificing the structural integrity of the engine. This eliminates unnecessary mass and allows a faster rotation response of the hood. The shorter height of the motor allows a lower center of gravity near the mounting point. 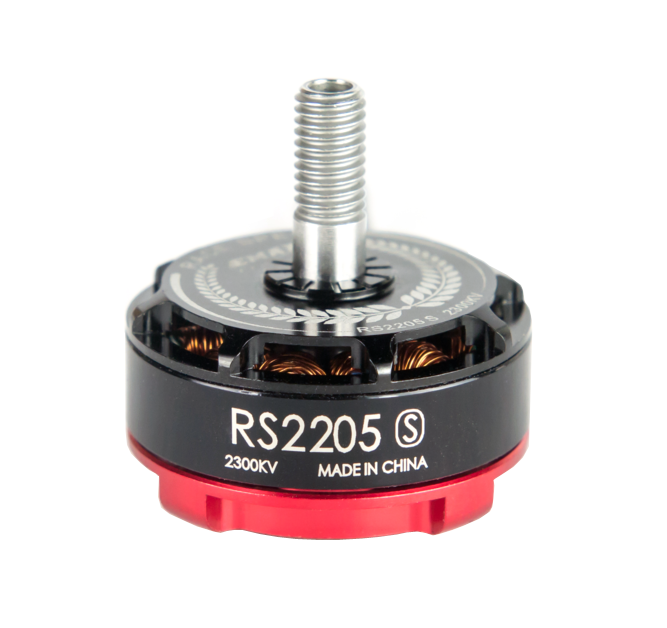 The cooling fins of RS2205-S have been reworked to keep the height and weight of the motor low while maintaining functionality. By using curved magnets N52SH, the tensile force between the stator and the magnet increases considerably. The motor design extracts every bit of force from these magnets and keeps it constant through the phases. The genuine Japanese NMB bearings guarantee smooth and durable operation. Compared with the RS2205, the new RS225-S advances another + 100g of thrust. Along with a KingKong 6×4 propeller, expect more than 1,400 grams of thrust (check out the complete engine results: http://www.miniquadtestbench.com/emax-rs2205s-2300kv.html ). Improved trees maximize durability. Do not worry about damaging threads during accidents. No more E-Clips. With a retaining screw, RS2205-S has no chance of having bells burst out during a race. It is also easy to repair the engine without the need for a special tool. We put together a list of best motors chosen by our editors and community. We hope it gives you ideas in choosing motors for your next mini quad build!